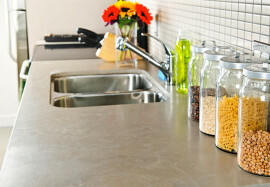 Marble, Granite and other natural stone surfaces are porous and can lose their luster and value due to damage resulting from foot traffic, spills, acidic cleaners, and everyday wear. Our experienced stone restoration experts can bring your stone back to new — or better! Light surface scratches and some mild chemical etching can be polished out using different polishing compounds, powders and crystallizers. StoneCare of Texas believes in a natural finish and does not use waxes or other surface coatings on polished stone, but uses a diamond grinding process to achieve a high gloss finish. 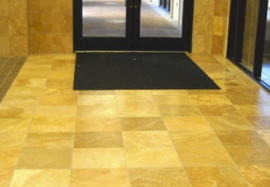 Poor installations can be a common problem with uneven tile. It can take away from the beauty of the natural stone and present a safety hazard. StoneCare of Texas can provide many levels of lippage removal. Stone and other natural surfaces are porous and can stain easily if not properly sealed. Determining the type of stain and choosing the correct chemicals and poultice materials are key to the removal of stains. Got cracks and chips? Need grout removal? No problem. StoneCare uses synthetic polyesters for the repair of marble and granite to give that natural polished look, and can also achieve complete restoration and removal of grout. Restore, don’t replace! Unfortunately, people go through the painful time and expense of replacing the stone tile from fire or flood damage without realizing that restoration provides a quicker and more affordable alternative. Visit our Case Studies gallery to view compelling before and after images and read the stories of projects we've done. Visit our Video gallery to learn more about our most popular services. If your marble has any unsightly damage or has simply lost its luster, there is a solution. Contact the stone restoration experts at StoneCare of Texas. We can hone away years of damage and etching and polish your marble to a matte, low-shine or glossy finish. Granite is a much harder natural stone than marble, and restoring granite requires specialized skills. 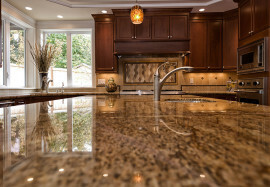 Because of the skill level involved, some companies shy away from restoring granite. The professional technicians at StoneCare of Texas are equipped with the proper knowledge and training diamond hone, re-polish, or clean and seal your granite. 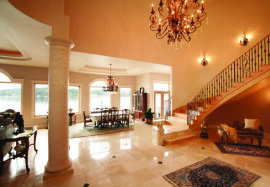 Travertine can be rustic, elegant, contemporary or traditional. Even though this stone is strong enough to stand the test of time (ie: the Roman Colosseum), it still requires professional polishing and sealing every few years to keep it looking its best. Limestone is an elegant and durable sedimentary stone, but it is somewhat porous and vulnerable to scratches, chips, hard water and acidic stains. 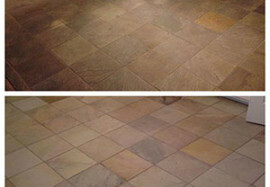 We can bring back the original beauty of your limestone floor or countertop and seal it to inhibit staining. Although slate is very durable and stands up well to heat and scratches, it can still chip, crack, absorb stains or become dull over time. The slate experts at Stonecare of Texas can strip any wax coating or sealer from your slate, then properly seal it. We also provide repair, honing (for a matte finish), and color enhancing services.